Get readeee! Get set! Starting April 1st (no fooling), I’m going to be writing a blog every day throughout the month about food. It will be A to Z. On the first day the blog will feature a recipe with the subject being “A” and so on each day until we get to “Z”. I hope I don’t have any trouble with any of the letters, but we’ll see. But anyway, we’ll be talking about a lot of different foods, so I hope you will check in with us daily. But I’m not alone, there are 625 writers signed up so far. It’s a great way to meet new people and get lots of interesting information. 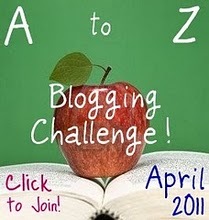 My BW, the education tipster, is participating too, so check out her blog in April.